Alondra Cottage in Blacko, Lancashire sleeps 5 people. Alondra Cottage in Blacko is an end of terrace cottage which provides a good standard of accommodation and retains many traditional and original features. Alondra Cottage boasts a fantastic location in the Lancashire village of Blacko and offers delightful, uninterrupted views of neighbouring Roughlee and Pendle Hill. Guests can even enjoy beautiful sunsets over Pendle Hill from the front living room. 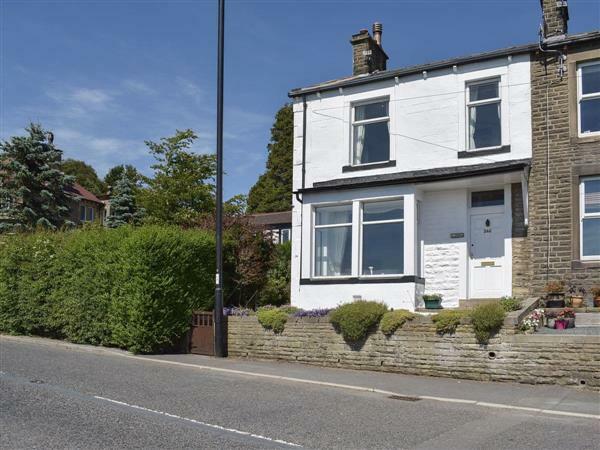 It is ideally located for exploring the Lancashire Countryside, including the Forest of Bowland, an Area of Outstanding Natural Beauty, and the Ribble Valley. You can even reach the Yorkshire Dales, Lake District and the Lancashire coast in under an hour. Alondra Cottage provides a great base from which to explore all the many walking opportunities on offer throughout the Pendle countryside, or for the more energetic the seaside town of Blackpool, home to The Pleasure Beach, Blackpool Tower and Blackpool Zoo, can be reached in just under an hour. The neighbouring village of Barrowford, just 1½ miles away boasts a number of local shops, a supermarket, pubs and restaurants. The popular market town of Clitheroe is only 14 miles away. The shop and restaurant are ½ mile from Alondra Cottage in Blacko, with the pub 400 yards from Alondra Cottage. Living/dining room: With wood burner, 24 Freeview TV, DVD player and CD player. Bedroom 1: With king-size bed and en-suite with bath, shower cubicle and toilet. Gas central heating, gas, electricity, bed linen and towels included. Initial logs for wood burner included. Cot and highchair available on request. Welcome pack. Lawned garden with sitting-out area and garden furniture. Private parking for 4 cars. No smoking. Please note: There are 3 steps in the garden. Holidays at Alondra Cottage run from Friday to Friday. Pets allowed at Alondra Cottage. For a better idea of where Alondra Cottage is, you can see Alondra Cottage on the map below. Alondra Cottage is in Lancashire; should you be on the lookout for a special offer, you can find all the special offers in Lancashire. It's always worth checking to see what is on offer at the moment. Do you want to holiday near Alondra Cottage (UKC2748), you can see other cottages within 25 miles of Alondra Cottage; have a look to find your perfect holiday location.